A surgeon has to make several critical decisions when performing a presbyopia correcting surgery on a patient. This surgery is intended to help patients reduce their need for glasses for reading. But perhaps the most challenging decision that he/she needs to make relates to selecting the right kind of implant technology. There are essentially three ways in which presbyopia can be addressed during a cataract surgery and Refractive Lens Exchange (Relex) surgery. These are: monovision, accommodating IOLs (Crystalens) and multifocal implants. Each modality or technology has its own pros and cons and is picked based on the individual needs of a patient. For those who have low levels of astigmatism and need intermediate and distance (not near) vision, Symfony lenses may be the ideal choice. The lens boasts of excellent refractive accuracy with rare occurrence of undesirable visual phenomena. Some other suitable options for such patients include Crystalens (Bausch + Lomb) and ReSTOR ActiveFocus (Alcon). Perhaps the biggest disadvantage of these implants is their non-physiologic visual properties. They typically require a ‘neuroadaptive’ technique to be performed (lasting for up to a year). Further, even though they are termed as ‘multifocal lenses’, these implants are actually bifocal in nature and hence do not provide a complete range of vision. Hence, patients may still face problems in seeing certain zones and would need to wear glasses. 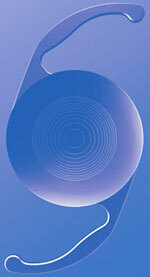 In the U.S., the Trulign and Crystalens are the most commonly used accommodating IOL technologies in presbyopia surgery. These lenses feature a hinged sensory platform and have proven to offer a higher level of independence with regards to spectacle use, especially when compared to traditional monofocal lenses. With Crystalens, patients can always enjoy excellent distance vision acuity along with good intermediate vision. And they do not require glasses. What makes this technology so effective is that in most cases, patients cannot completely avoid wearing spectacles and need at least reading glasses, even if with a minor prescription. But with accommodating IOLs, most hyperopic clients report being satisfied with vision quality and do not require spectacles for any further vision improvement. Also, patients who need improved distance vision without experiencing glare or halos in the nighttime, are also good candidates for accommodating IOLs. A detailed examination and consultation with your eye surgeon can help determine the right implant technology for presbyopia correction during cataract surgery or during Relex surgery. Some of the important implant properties that may be considered for selection include asphericity, optic size, refractivity and stimulated spherical aberration.